Description: Cap 2 to 8 cm across, convex then soon flat and depressed, funnel-shaped in center, margin inrolled, wavy; deep yellow to yellow-brown, paler with age. Gills decurrent, narrow, blunt, and irregularly branched and vein-like; yellowish to gray-violet. Stem 25 to 80 mm x 4 to 10 mm, hollow, often flattened or grooved; yellow to dull yellow-orange. Flesh pallid yellow. Odor and taste pleasant. Spore print white. Habitat: Scattered to clustered on soil, moss, and rotten wood in conifer woods during mid-winter. Locally December to February; frequently surviving or reappearing after snow. Primary Keys: small chanterelle; tan/brown cap; well developed false gills; yellow stem; mild to slightly fragrant taste and odor. Edibility: Edible. The Finnish regard it as highly as the common Chanterelle. It’s a mild mushroom that needs a fairly delicate approach. The stems are sometimes tough. If so, caps can be cooked and stems may be used for stocks or purees. Notes: This mushroom was formerly in the Cantharellus genus along with the common Chanterelle. DNA analysis has moved it to Craterellus along with the black trumpet chanterelle. 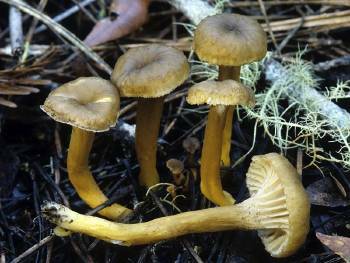 It also was formerly know as Cantharellus infundibuliformis, Cantharellus tubaeformis, or Craterellus infundibuliformis. There is still a bit of uncertainty about the Cantharellus/Craterellus complex – specifically Eastern vs Western U.S. and European species. See MushroomExpert.com for further information. Mix together the grated Emmental cheese, sour cream and eggs.